Discussion in 'White Hat SEO' started by bumbo90, Sep 15, 2014. Hello guys, I have other projects that get me enough money. Recently, I was given a free domain and hosting from a friend. I don't know much about SEO. Well, I know the basics, but I don't have much experience with it. I also have around 50 articles (each is 1000 words) that I also got as a gift. I don't have much time to focus all my efforts on SEO right now. My question for the experienced: can I get traffic to my site just by posting the content? I am not looking for more than 100 visitor a day. Is that possible? or will I have to spend time on building backlinks and promoting my site on social media? Unless the niche has VERY little competition probably not much. If you find a good niche and great keywords to target then MAYBE... but even then I'd think you'd want to at least do some social. But for 100+ visitors a day (or even 40) I would say there is VERY slim chance to zero chance. So build-a-website-and-they-will-come-on-their-own philosophy doesn't work. It won't even bring me 40 views a day. If you are asking "can I get lots of traffic without SEO" then the answer is YES! In the beginning, you'll be able to get way more traffic from non-organic sources. Like posting on social media sites like reddit, stumbleupon, (provided your content is good...) and forums in your niche. Even guest-posting will drive way more traffic (with less work) than SEO, until you've got a really authoritative site. Yes it works if you can pick good keywords and good niches. 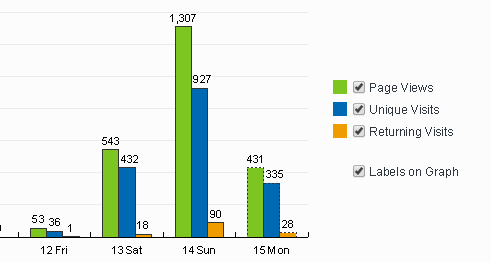 I started a new site on 12 September 2014, and just in 3 days I have crossed 1000+ visitors. Today, it is only 8 hours passed and I am already at 300+ visitors. All i did was just a lot of content. Just focus on onpage SEO and quality content. There are many websites who rank on low competition keywords only by internal linking, so it's not impossible. Also, if you have 50 articles, see if you can group them in silos and make a silo structure, that might make a huge difference. Good luck! same Question, any one help me plz ? With good on site SEO and HQ content you CAN get great traffic once your site is being crawled daily. If you want to update content only at a new site / blog, focus keywords that VERY low competition. This is probability 1% to get traffic from Google. My blog that in non English language get hundreds of visitors monthly from Google without any backlinks. Why not to do link building also? Choosing proper keyword + content that pass copyscape 100% + link building method that working for this year ---> probability 99.99% to success. It depends on your niche. But Link Building is also important think. So think on it and go ahead! I like to know about your niche. Is it less competitive or high competitive? For less competitive niche you can get traffic though unique content. But, for high competitive niche it won't be much effective to get traffic. You should contiune other white hat SEO beside unique content. It depends, if is a good niche and also unique content you can expect, but keep in mind that if your website is similar like others people used to visit then you cant expect they start visiting your instead of usuall. Content marketing work well these days only if you have quality content. The thing is not just post your articles in any site, it should be always an active and real visitors. Open comments for your article by this way you can keep coming comments to your articles this is how you will drive traffic to your content. Yes it is possible. you have to focus on page SEO and high quality more content. Of course you can get traffic just from the content. You need to do solid keyword research and focus on targeting as many longtails of your main keyword as you can, without "over optimizing" your content. You may need to do some VERY minimal link building to get your stuff indexed, but you should be able to get up to 50-100 unique visitors daily easily if the content provides value to the reader and you've identified your keywords properly.